Impressive account of the events in Brazil and the conditions of the class struggle, from 2013 to the impeachment of President Dilma in 2016. On the current events in Brazil: against electoral-media polarization, against all factions of capitalism: intransigent social struggle !!! As is well known in Brazil and the rest of the world, since March the working class has been bombarded by considerable political hysteria. The current ideological pressure corners and defeats the working class as a whole. On the one hand, the PT's social democratic government 1 - the eternal enemy of the workers and of the socialism - which militarizes slums, attacks civil servant, filled prisons with demonstrators in 2013-14, enacted an anti-terrorist law against social protest, and only in the early months of 2016 has in its account the murders of 50 rural / indigenous workers. It is the government that crushed the greatest workers revolt since 1978-79, the workers' struggle at the Jirau, Santo Antônio and Belo Monte hydroelectric plants, where they were enslaved by OAS / Odebrecht / Camargo Correia enterprises, not by chance PT financiers and involved in today's scandals. It is the government that between 2003-2005 approved attacks on the retirees and that caused much suffering, with the necessary accompaniment of corruption and robbery to have football World Cup and Olympiads. It is the party that has spent 20 years in the "opposition" breaking strikes, delivering revolutionaries to the police and making deals with businessmen, governors and mayors, that is, disciplining, subjecting, manipulating and oppressing the working class already in the "opposition", which was the condition for rising to power. On the other hand, the old traditional political groups, identified with the electoral and militant "right", do not hide their sympathies for fascism, military dictatorships, nor hide their sanguinary pretensions of an order built on the extortion and misery of millions of workers. Always aligned with the PT, including supporting all its repressive policies, it governed along with it inside and outside the opposition. "Opposition" very comfortable in recent years, which adhered to most of Lula / Dilma's projects against the working class (outsourcing, PAC 2, World Cup, Olympiads, sale of lots in the Amazon, militarization, forest code, etc. ), and benefited from the exemptions of billions in taxes promoted by the PT. Even the most aggressive parties against Lula / Dilma voted in favor of all these measures in Congress, and in state governments they were supported by the participation and / or complicity of the PT in terror actions - evictions, police massacres, curfew. Most of this right, which today is the "sworn enemy" of the PT, was its ally until days ago. While PT wore out, and the working class felt the intensity of the crisis that began in 2008, now reaching its maximum level, with part of the right excluded from federal power, where it could not have direct access to the product of the robbery, that right that was the support of the PT for years, now turns against him. This administrative derangement between the two capitalist gangs, who never had any divergence of program, of objectives, still less about the model of society that they defend, this electoral competition since the end of 2014 has seriously threatened the working class. It is necessary to emphasize, in an undeniable and clear way for all, that this manipulation maneuver, which marks the transition from one state management to another, that all this ideological pressure is the result of the defeat of the workers in the social war that occurred in 2013-2014. By its own purpose and developed actions, PT / right duality promoted, especially in the combined action against the 2013 revolt, the pacification of the working class and the empowerment of the right. The pacification policy was violently driven by apparatus that infiltrated social struggles and destroyed them (MPL in 2013, MTST before the World Cup), all accompanied by state terrorism (PT and governors killing and arresting demonstrators) and the opening of demonstrations to the patriotic-fascist right, perfect excuse for the Dilma government's defense against the "right-wing danger" and perfect opportunity for an "oppositional" regressive force to absorb and entice all discontents. The pacification policy was violently driven by apparatus that infiltrated social struggles and destroyed them (MPL in 2013, MTST before the World Cup 3), all accompanied by state terrorism (PT and governors killing and arresting demonstrators) and the opening of demonstrations to the patriotic-fascist right, perfect excuse for the Dilma government's defense against the "right-wing danger" and perfect opportunity for an "oppositional" regressive force to absorb and entice all discontents. Unlike enemy forces fighting to eliminate the rival, it is an orderly and within the bourgeois order dispute. The two groups are sustained and watch over the social order, acting together to prevent the emergence of a true alternative - which can only be revolutionary - and so appealing to fulfill this mission in an apparent daily war. This whole scenario coincides with the maneuvers of international imperialism: European capital (France, Germany and Russia, a member of the BRICS), which feels threatened by a right-wing turn, advocates the Dilma government. The British and US capital openly supports the actions of the Brazilian right, even funding reactionary organizations that are taking over the protests and by this reason refuse to publicly show the sources of their resources (George Soros and Koch Brothers make millionaire donations to groups such as MBL - Movimento Brasil Livre 4- , Revoltados Online, MCC, Estudantes pela Liberdade, Atlas, among others). Also the mark of social classes disputing the opportunity is obvious: the state bourgeoisie (hence the allegations of corruption prioritize state directors), associated with some national business groups, are behind the PT (which has its infantry in the unionized and in assisted by the state working-class sectors), while the landowners (agrarian bourgeoisie), the Federação dos Industriais (industrial bourgeoisie) and the commercial bourgeoisie (AMBEV 5, shopkeepers networks) are with right / far right. They recruit the petty bourgeoisie (liberal professionals, small tradesmen, high and middle career state employees, bankrupt businessmen), socially retrograde and historically without future, to be the public face of the protests. This petty bourgeoisie has dragged behind it, with support from the media, the backward sectors of the working class, who really want transformation and rebelled against the PT. But because of their inability to organize themselves and even to exercise autonomy against right-wing / far-right-wing ideologies and organizations, they became an easy prey to the militant right. In addition to serving as "poster boys" of these groups they can now count on the excuse of having "workers" in their ranks. The banking-financial capital, which has the final word, which in the blink of an eye makes and overthrows any president, spent the month of March wavering and wavering over who to support. And it could not be otherwise, since they have always been well rewarded by Lula and Dilma, with years and years of stratospheric profits (the largest in the world) due the interest rate policy of government. With the suspicion that Vice President Michel Temer may include a representative of the Federation of Banks in his government, or the puppet of George Soros in Brazil, Armínio Fraga (head of the Central Bank in the FHC government), the suit against Dilma accelerated in less than 3 days, which indicates that they finally decided on one side. The exit of the PT went from possible to inevitable. Once the demobilization of workers with the defeat of the struggles of 2013-2014 has been perceived, the bourgeoisie has imposed a false choice between two political loyalties which, in addition to alienating the workers, who have lost the protagonism of the streets, sow the division between them. First they are alienated when they cheer for judges and prosecutors, the largest representatives of state repression and venal judiciary, or by accepting the role of heroes given to sensational TV presenters and corrupt old / mercenaries of politics. And then, when they lean like sheep for Dilma's departure "against corruption" or for her permanence, "against fascism." It was when the media - accompanied by the "left" of the capital - invented the legend of "social polarization" between defenders of corruption and defenders of fascism as if it were a class struggle. By promoting incessantly the PT / antiPT dispute, the bourgeoisie wants everyone to forget the true polarization: WORKERS AGAINST BOSSES, COMMUNISM / ANARCHY AGAINST THE STATE AND CAPITALISM and accept the theatrical competition between the right and PT capitalist brothers. The climate of permanent electoral campaign imposed the dictatorship of the pensée unique, with the prohibition of thinking or acting outside the right/PT duality, which at all levels favors social control. The division between workers, and THIS IS THE MOST SERIOUS ASPECT, is due to the politicization of private life: according to the preference of someone, real or assigned, for or against the government, personal relations are destroyed, relatives and neighbors do not talk to each other anymore, a storm of hatred and denunciations spreads in the virtual environments and in workplaces and schools. Lynchings and physical attacks are also occurring. It is a Venezuelan-type environment, where the false choice between being right-wing elitist or pro-government populist, with conspiracy and paranoia on both sides, is increasingly imposed in everyday life. The police of thought and ideological patrol, so useful to the state in fascism and democracy, show their usefulness. Electoral totalitarianism was able to achieve aspects of everyday life that seemed to be immune to it. 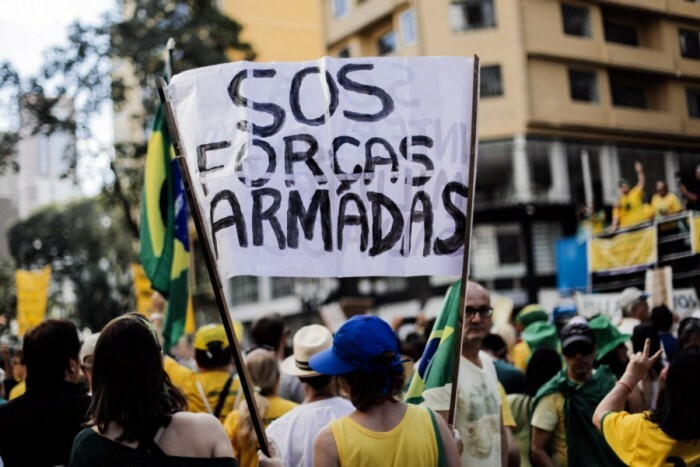 The capitalists in Brazil and abroad fear a new 2013: draconian economic measures are already programmed (austerity, unemployment, attack on pensions), to accept increasingly unfavorable contracts and even worse conditions of survival. And with the current struggles in progress (schools occupied in Goiás and Rio de Janeiro, factories being occupied in Sao Paulo, rural / indigenous demonstrations), capitalism makes the double demand of quickness in the imposition of measures and of a strong government that can impose it. To this end serve either the permanence of a shared government Dilma / Lula or the arrival of the more kleptocratic right to power through coupist expedients. The two factions measure forces among themselves to see who has the most strength and incorporate more consensus (greater power of mystification) against the workers. In the face of this, the working class needs autonomy against false social polarization, sustaining and uniting its ongoing struggles, organizing itself independently against anti-corruption and anti-fascist groups, rejecting jointly both the right and the united front that the PT is dictating against fascism. The double blackmail of fear of "economic chaos" versus fear of the fascist coup must be faced with decisiveness and radicalism. Within a short time the Brazilian State will decide, vote and approve the end of the Dilma government. The working class must boycott the protests of both parties and intensify the social struggles against both. The PT is preparing to return to the "opposition", where after a coup government and violent measures of misery, can return to power in conditions even better than those in 2018. Yes, the right is already campaigning for Lula now and in that sense is his collaborator. The right celebrates in advance the end of the PT period in government and with this, may be better able to exercise its own corruption and bleed the working population. The price of "anti-corruption" and "anti-fascism" is being paid: it is the misery of those who live and the persecution, the death of those who disagree. Between varieties of slavery there is no choice, we must fight. THE TRUE CHOICE IS NOT BETWEEN PT AND ANTI-PT, IS BETWEEN REVOLUTION AND CONTRA-REVOLUTION !!! AGAINST GOVERNMENT AND OPPOSITION: WE MUST INTENSIFY THE SOCIAL STRUGGLE !!! 3. Translator's Note: MPL = Movimento Passe Livre, Free Fare Movement. MTST = Movimento dos Trabalhadores Sem Teto, Homeless Workers Movement. 4. Translator's Note: MBL, Free Brazil Movement, is a right-wing reaction to MPL, even in its own name. 5. Translator's Note: AMBEV is a brewing company.